Soundtrack Pro 1.03 finally feels about perfect. The software itself aside, here’s why it matters to me — and why its transition to Intel will be different from its pro brethren. Standalone audio editors can save tremendous amounts of time, preparing samples for instruments, batch processing recordings, fixing problematic audio, and generally letting you focus in on anything that needs to be done to individual pieces of sound rather than a whole multitrack audio product. Your options are plentiful, too: Peak Pro and Soundtrack Pro are both fantastic on the Mac, and while I personally use them less, PC users have three great choices in Steinberg WaveLab, Adobe Audition, and Sony SoundForge. 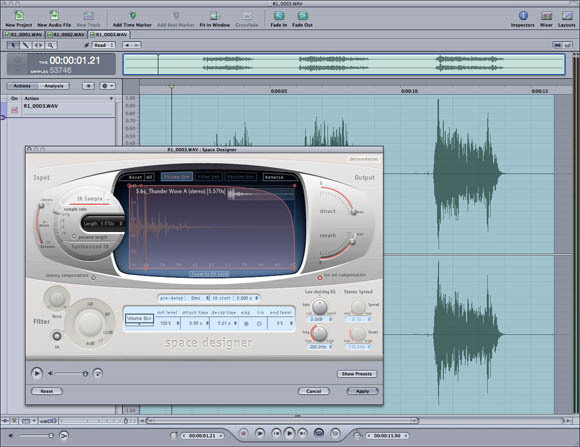 (Yes, there’s also the free Audacity, though if you can spare the money, these other options tend to run more smoothly and offer more features.) Whichever you pick, I certainly endorse finding one you like and investing in it. Of all of these, though, I strangely enough find Soundtrack Pro is the editor I keep coming back to. Apple has quietly discontinued Soundtrack Pro as a standalone audio product; you’ll now only be able to get it as part of Final Cut Studio. But whatever Apple thinks of its potential for the music market, I still use Soundtrack heavily in my own work, with and without Final Cut. There’s a simple reason: I use a lot of sampled audio, and I’ve found no better tool for manipulating samples than Soundtrack. I’ve already reviewed the product, but here’s a sense of what using Soundtrack is like from a personal perspective, after nearly a year with the application. And if you’re thinking about getting it, or thinking about getting an Intel machine, I’ll give you a sense of the rather complicating pricing and purchasing scheme, which could mean bad news for you — or an incredible bargain — depending on your situation. Soundtrack Pro, despite the similarity in name to Soundtrack, was really a 1.0 release when Apple launched it a year ago. Apple raised expectations pretty high as they tend to do for all their products, and based on reactions I heard, some users were disappointed. Notably, many of these were trying to use Soundtrack as something it’s not: a full-featured multitrack audio recorder. I got an email from a fellow who was trying to record an entire symphony orchestra — as 80 or 90 tracks or something like that — into Soundtrack Pro. (I would opt for the usual suspects on a job like that: Pro Tools, Cubase/Nuendo, SONAR, DP, or Logic; I don’t think Apple ever claimed — or envisioned — Soundtrack would make sense for such a task.) I think many users misinterpreted Apple’s enthusiasm for the product as a statement that it was the only audio tool they need. Also, users were understandably frustrated with early bugs: first, the much-touted integration with Final Cut Pro didn’t work right. Then, when that was fixed by early summer, odd random instability and other strange behavior lingered. Soundtrack was flying high in the press, but reviews were mixed to poor on the user forums. Certainly, many people saw its potential; a celebrity endorsement from famed audio editor and film editor (and self-avowed Final Cut aficionado) Walter Murch is nothing to sneeze at. But to my surprise, few people seemed to recognize the appeal of using Soundtrack Pro alongside other audio applications (which is something I explicitly stated in my review for Macworld). After a succession of updates, I’ve found Soundtrack Pro now behaves extremely reliably. It’s the most stable stereo audio editor on my system; while in late summer it was crashing occasionally, it’s now rock solid, and I use it on nearly every project. Just as important, though, I find Soundtrack an essential part of my workflow. Here’s an example: this week a choreographer I was working with wanted some vocal samples. We had about five minutes after a rehearsal and wound up vocalizing in the bathroom of the dance space in Soho. Now I had several minutes of somewhat poorly-recorded sound loaded onto an Edirol R-1 portable USB CompactFlash recorder. Enter Soundtrack. Drop the files on the hard drive from the R-1 into Soundtrack. Slice up the audio into separate files. This is especially easy to do with Soundtrack in its default looping mode, because you can adjust the selection points while the sound is looping, then create a new file from the selection (File > New > File from Selection). Kill the noise. There was some significant background noise in some of the recordings because of where it was recorded. I always leave some extra “room tone” on the recording so I can isolate it. Process > Set Noise Print with that noise selected, then select all and choose Process > Reduce Noise. (I did this on a clip by clip basis so I could adjust the settings to the material.) Soundtrack’s noise reduction facility works exceptionally well, particularly if you adjust your settings while listening only to the filtered noise. Add compression, normalize, filter. I planned to use these files as samples in Reaktor and Logic, so I wanted to smooth out the dynamic range in advance. Since Soundtrack features the same audio plug-ins in Logic Pro, this is an easy matter, especially if you’re a seasoned Logic user. I was also able to do more problem solving, like removing some low-end rumble. Action layers: It was Soundtrack’s most-hyped feature at launch, and I still love it. You can add effects as chains of non-destructive actions, a bit like the layers in programs like Photoshop, then go back and change the order of events, add or remove actions, and change parameters. It’s perfect for “what-if” scenarios and for fine-tuning sound sculpting decisions, like creating just the right drum hit for a drum set you’re designing. The Analysis tab, for finding clicks and pops, clipped signal, and silence is equally useful. Logic Pro’s plug-ins: I can’t really say enough about this. The combination of Logic’s terrific and often bizarre sound shapers with your existing AUs (and thanks to FXpansion, my VSTs, too) makes Sculpture a fascinating place to do your sound design. Sample of me hitting a pot + odd Space Designer preset + the rotary from Native Instruments’ B4 II which happens to be in my AU folder = good, clean, sound mangling fun. I’ve been designing all my drum kits, granular samples, and initial project sounds in Soundtrack lately. Sound effects: No, I wouldn’t dream of using Soundtrack’s effects library in a video production process. But I sure would warp them into unrecognizable form as a sound design source. Simple multitracking: Soundtrack’s GarageBand-like multitrack interface isn’t where I’d finish a project, but it’s perfect for combining two or three sounds into one — like assembling a layered drum sample, for instance. Looping: No, it’s not what you think. I barely touch the Apple Loops looping feature in Soundtrack, because I don’t need it. But Soundtrack loops every selection and auditions effects changes in real-time, so that you’re constantly listening to the sounds you’re working on. I still prefer Peak’s batch-processing and high-quality dithering and re-sampling features, and its analog tape-like previews (though I hate Peak’s newly-acquired dongle), and Peak Pro recently upped the ante with a drool-worthy set of plug-ins. You’ll also need Peak for mastering CDs that you’re sending to mastering houses, though if you’re just burning CDs on your computer, I also like Logic’s WaveBurner. I don’t think Soundtrack is necessarily the best audio editor for everyone, either. But for sound design, it really is irresistible. If you don’t have a copy of Soundtrack: While Apple has discontinued the standalone Soundtrack, there are still copies out in the retail channel for US$300 or less. (Maybe because they weren’t selling?) I don’t think that’ll always be the case, of course, but it is as I write this. If you have a copy of (the old) Soundtrack: Soundtrack came before Soundtrack Pro and even predates GarageBand. If you’re one of the few people who have a copy, it looks like there are still upgrades for US$99 out in the channel. It’s a must buy for you, really, because it’s such a bargain. If you have Soundtrack Pro but want Final Cut Studio: You’re really in luck. Soundtrack Pro = $300. Apple’s new upgrade for Soundtrack users to Final Cut Studio = $199. Total cost = about $500. Cost of Final Cut Studio new = $1000. Get the picture? Now the big question is, what happens to Soundtrack next? It seems likely to get an update along with the next release of Final Cut Studio, and I expect Apple will focus on the needs of its video production customers when that happens. (Real surround support would be at the top of my list, as well as improved Final Cut integration and other pro video features.) That leaves the music market. The obvious next step for Apple would be to integrate Soundtrack’s audio editing facility into Logic, especially since Logic’s own paltry wave editor is looking more than a little long in the tooth. But I imagine the feature upgrade list for Logic is pretty long as it is, so this isn’t necessarily a sure thing. I hope at the very least Apple will bundle Soundtrack with Logic. As for the rest of you who aren’t Logic users and didn’t pick up Soundtrack as a $300 bargain-buy of all Logic’s effects, well, I think you’re probably out of luck. Keep your eyes peeled as we watch this story. Now I’m back to my sound work, if you’ll excuse me. Walter Murch, extensive links, books, videos, lectures, etc.